Beautifully and Modernly Renovated Oceanfront Condo with Pool & Hot Tub! 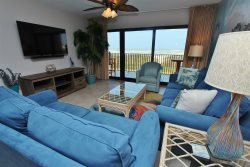 Come enjoy the incredible views that await you from every window in this oceanfront condo! The great room and master bedroom feature a wall of windows and sliding glass doors that lead out to the 26 foot oceanfront balcony. Here you will enjoy watching the Gulf of Mexico and the beautiful sunrises that await you daily! The balcony is the perfect place to start your day with a freshly brewed cup of coffee or to relax with a margarita at the end of a day on the beach! This newly renovated condo has a great room, which features plenty of seating for your group with 2 sofas (1 is a sleeper sofa) and 2 side chairs. You will enjoy spectacular views of the Gulf and beach from the comforts of the sofa while you enjoy the LCD Cable TV and HBO! There is also a DVD player if you plan to rent or bring movies with you. Wireless internet is also provided. There are two bedrooms and two baths in the condo. If you choose to lounge in bed for a late relaxing morning you will enjoy watching the ocean out of every window in the master suite which features a king size bed and a private luxuriously renovated bathroom. The guest bedroom features a queen size bed and a twin bed. It also has direct access to the hall bathroom which has been renovated and features a rock walled rain shower. Both bedrooms come with large LCD TVs. After a fun day on the beach, you can relax in the evening and enjoy the beach and Gulf from your front balcony! The views can’t be beat at this South Padre Island Condo. Seabreeze 1 Condominiums have beautifully landscaped grounds with a heated pool and hot tub for your enjoyment! Please come enjoy all that South Padre Island has to offer in this fantastic oceanfront condo. This is the perfect time of year to visit the island! Super friendly and hel o full staff. Great property, it is the only place we will stay when we come to SPI.